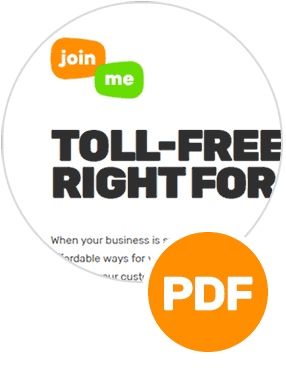 At the start of your join.me meeting we’ll show you where to connect to join.me audio. 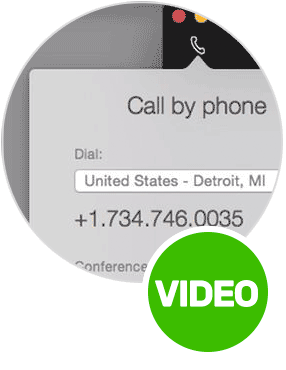 Once you click the phone icon you’ll have two ways to connect to audio – calling via internet or by phone (we even have toll-free options - click here to learn more!). Watch the video below for step-by-step instructions on how to connect audio to your join.me meetings. At the start of your join me meeting, we’ll show you where to click to connect to join.me audio. Click the button. You’ll have two ways to connect – by computer, or by phone. If you choose call by computer, You’ll see the controls for your microphone and speaker settings. Make sure the proper microphone and speaker are selected, then click “Call” to dial-in. To call in by phone, click that button. 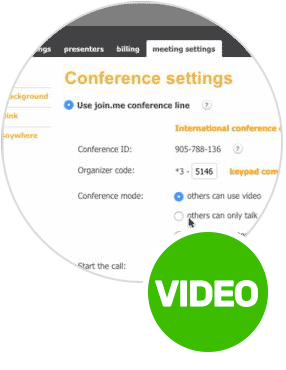 You’ll see your personal dial-in details , that you and your meeting attendees will use to connect to the call. You can select the dial-in number that is best for your region from the drop-down. Ready for your call? Dial the number, enter your conference ID, and you’re good to go. And here’s a helpful tip – you can set join me to remember your audio preferences. Simply check the “remember” box on your audio menu. If you hear a beep, you’ve done something right! You’re connected to the meeting. You’ll hear this message when the first person has joined your meeting. During your meeting, you can quickly mute your line with the microphone button on the toolbar. When this button is red, your line is muted. To unmute yourself, just click the microphone again. There! You’re good to go. Now start collaborating!